Longhirst Hall is a truly magnificent Grade II listed country home set amongst its own grounds, surrounded by trees and open green spaces, it certainly is a grand location. With a background full of nature many wildlife have been spotted making themselves at home including deer, heron, owls and squirrels. These exceptional homes are a fusion of the breath taking, historic exterior and contemporary interior with truly unparalleled restoration work which is devoted to detail and quality of finish. The Manor House opens its doors to a stunning entrance with high quality parquet flooring leading into the magnificent kitchen / family area. The vast kitchen plays host to handmade and hand painted units, granite work surfaces, Bosch Range cooker. Integrated appliance by Smeg include Fridge Freezer, Coffee machine, Microwave, dishwasher & Wine Fridge. Not surprisingly the main reception rooms are wonderfully proportioned, providing significant entertaining spaces. High quality oak parquet flooring has been laid whilst the original skirting and cornices have been kept and revived back to their former glory. At the bottom of the staircase a peaceful and bright garden room is an ideal location for quiet moments reading a book or enjoying looking out to the garden area. Leading on from the staircase is the Master suite, which overlooks the mature gardens, the space also takes in a dressing room and ensuite with freestanding bath which comes complete with natural stone tiles, granite surfaces, his and hers sinks, shower and freestanding bath. The three further bedrooms are similarly remarkable including ensuite and dressing rooms to some, with the stunning main family bathroom to complete this floor. Built between 1824-8 for local landowner William Lawson, Longhirst Hall is considered to be one of architect John Dobson’s finest buildings. 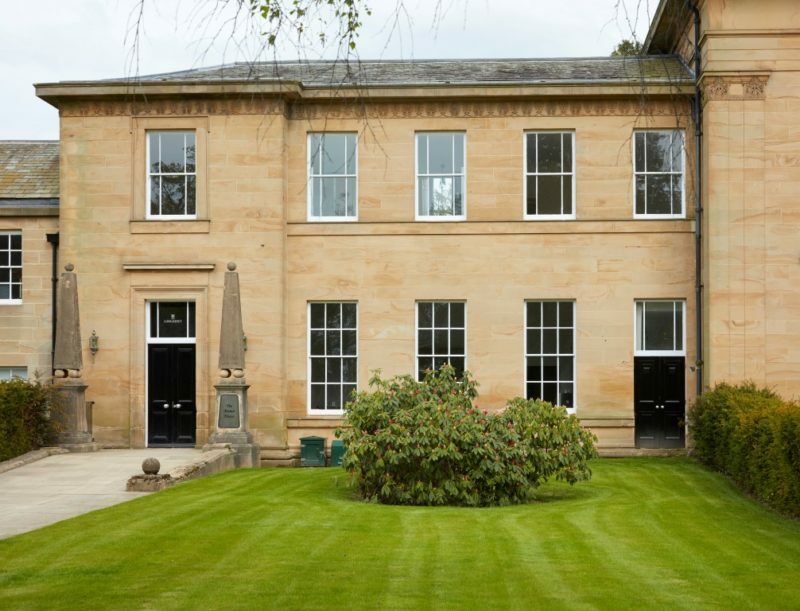 The impressive mansion, with its extensive grounds has today been restored to its former glory whilst being renewed as four outstanding luxury residences – a transformation which has been painstakingly undertaken by Dere Street Homes. 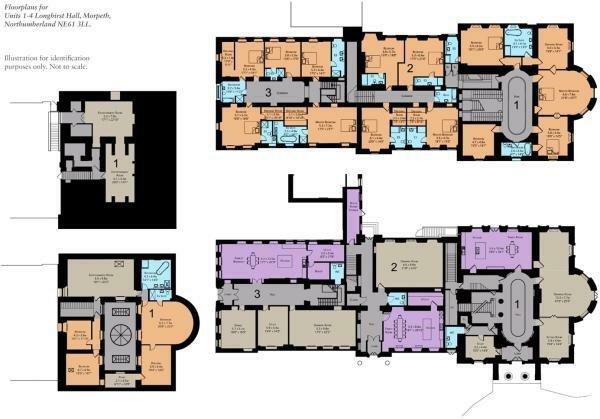 Lobby 1.53m x 2.04m 5'0" x 6'8"
Entrance Hall 4.38m x 3.21m 14'4" x 10'6"
Cloaks 1.78m x 1.94m 5'10" x 6'4"
Cloaks & Boiler Room 8.06m 1.89m 26'5" x 6'2"
Drawing Room 6.61m x 9.86m 21'8" x 32'4"
WC 1.97m x 2.70m 6'5" x 8'10"
Utility 1.97m x 5.26m 6'5" x 17'3"
Family Room & Kitchen 5.48m x 8.82m 17'11" x 28'11"
Bedroom 6.10m x 4.15m 20'0" x 8'10"
Walk in Wardrobe 2.26m x 2.00m 7'4" x 6'7"
En-suite 2.71m x 2.22m 8'11" x 7'3"
Bedroom 4.84m x 5.72m 1'10" x 18'9"
En-suite 1.70m x 3.43m 5'6" x 11'3"
Bedroom 5.33m x 6.61m 17'5" x 21'8"
En-suite 1.20m x 4.27m 3'11" x 14'0"
Bath 2.10m x 3.18m 6'10" x 10'5"
Bedroom 5.51m x 4.66m 18'1" x 15'3"
Walk in Wardrobe 2.08m x 2.75m 6'9" x 9'0"
En-suite 2.68m x 2.79m 8'9" x 9'1"